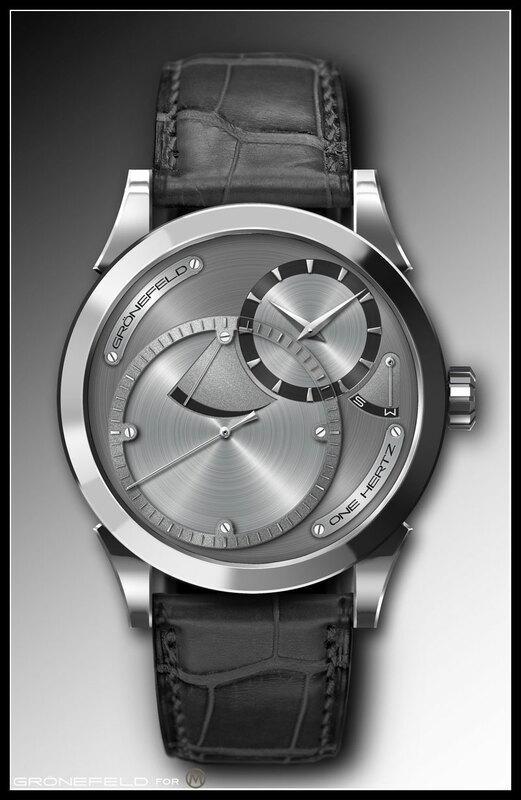 The "Horological Brothers" reveal their first automatically wound timepiece. Simpler, but no less high-end. It took Tim and Bart Grönefeld, the charismatic “Horological Brothers”, almost three years to reveal a new watch. 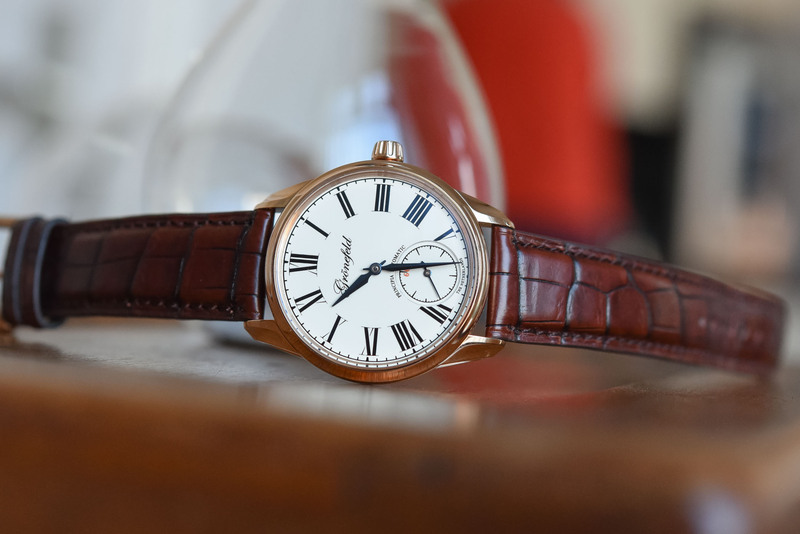 Certainly, they are not the most prolific watchmakers when it comes to novelties – meaning that when something new is coming to the market, we’re quite enthusiastic. 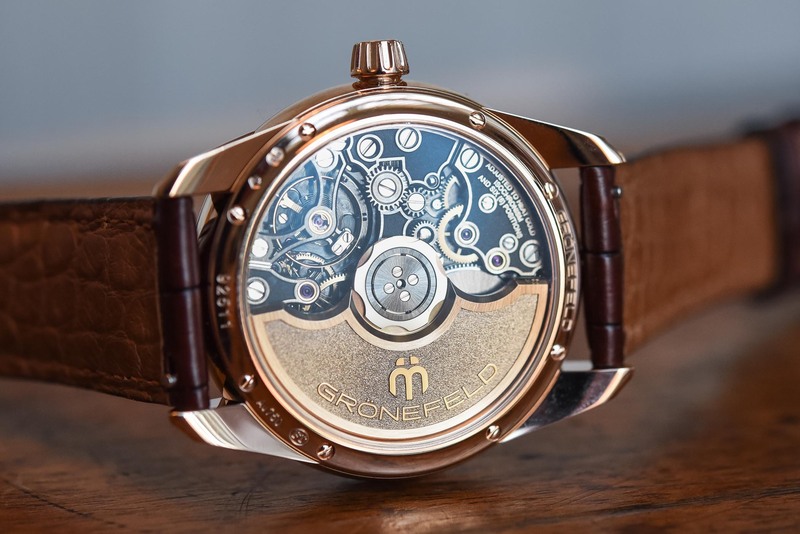 While all of their previous creations feature a complication (a tourbillon, an oversized dead-beat second or a remontoire), their new watch is a simple automatic 3-hander. But we prefer to avoid the word “entry-level” here as clearly the new Grönefeld 1941 Principia is all about (very) fine watchmaking. The name of this new Gönefeld’s creation refers to the work of Sir Isaac Newton, “Philosophiæ Naturalis Principia Mathematica” (often referred to as simply the Principia), which formulated the laws of motion and universal gravitation. Gravity in watchmaking is often seen as an enemy – hence the creation by A.L. Breguet of the tourbillon. But not always. In the case of an automatic watch, gravity is the key to the winding system, making sure that the oscillating weight transfers its motion to the winding system… And because the new Grönefeld 1941 Principia is the brothers’ first self-winding piece, gravity here is a good friend. That was for the background story. Now, let’s have a first look at the Grönefeld 1941 Principia (which we discovered a few hours ago in their Netherlands-based atelier). As mentioned, the 1941 Principia is the first 3-hander, complication-free watch that the brothers have ever created. Some might think they’ve gone the easy way or that this new watch will be seen as an entry-level piece… Price-wise, it certainly is their most affordable watch. 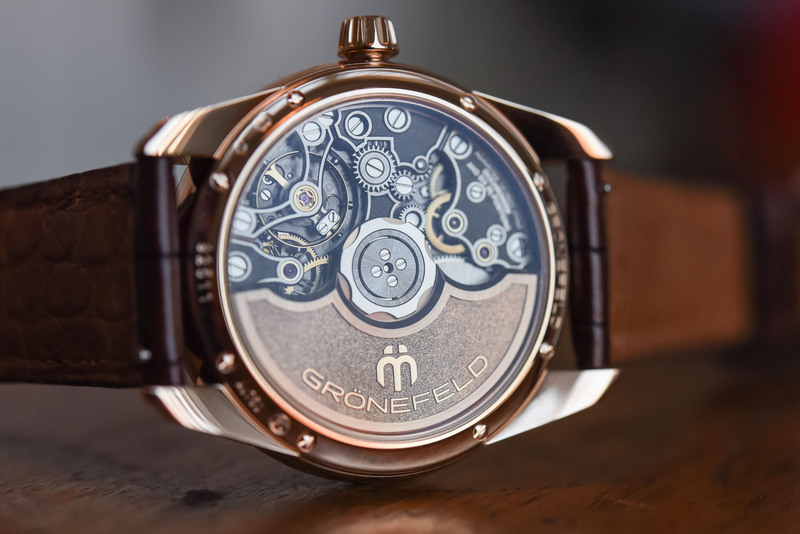 Mechanically-speaking and finishing-wise, it remains Grönefeld from head to toe – and that means a superbly finished movement. Don’t expect shortcuts here. As for the case, which will be available in 18k red gold, in 18k white gold (non-rhodium-plated) or in stainless steel, the Grönefeld 1941 Principia is in line with the 1941 Remontoire and shares the same design and dimensions. The case measures a reasonable 39.5mm diameter and remains relatively thin at 10.5mm – a very decent size for a daily use. The shape is also the same, with a complex, modern and unique shape. The sculpted case is executed using specially shaped cutters to create the characteristic hollowed, concave recesses and convex surfaces. In between each additional cutting phase, the case is polished prior to the next stage of milling, ensuring the precisely defined contours of the case are retained. 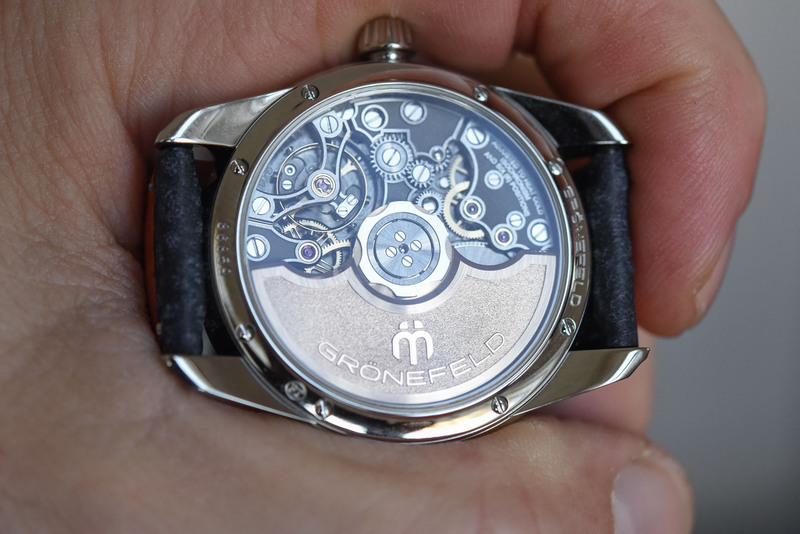 As for the case, the new Grönefeld 1941 Principia relies on signature designs for the dials and hands. As always with the “Horological Brothers”, customization will be key and you’ll be able to order for instance handmade engine-turned dials (with or without enamel) just like this one. 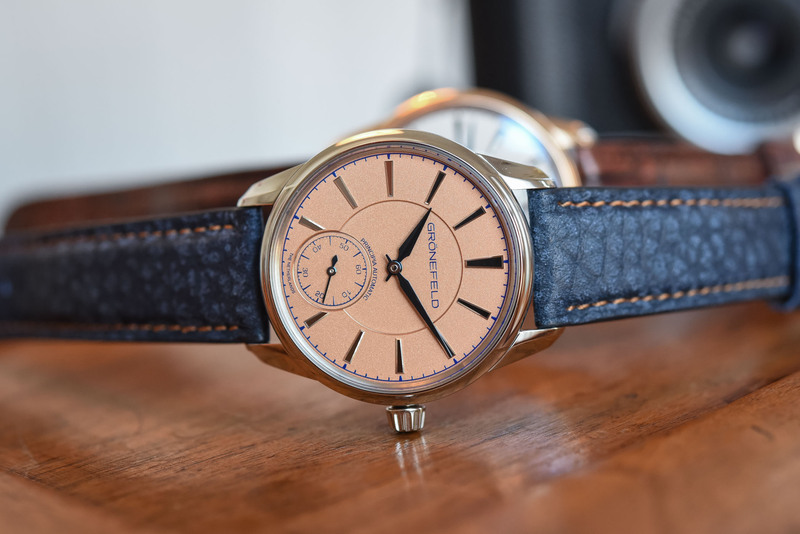 As a standard, the watches will be delivered with solid silver dials with the brand’s usual grained finish – dials are available in rhodium-plated or gold-plated “salmon”, or in matte turquoise or light blue (not photographed here). 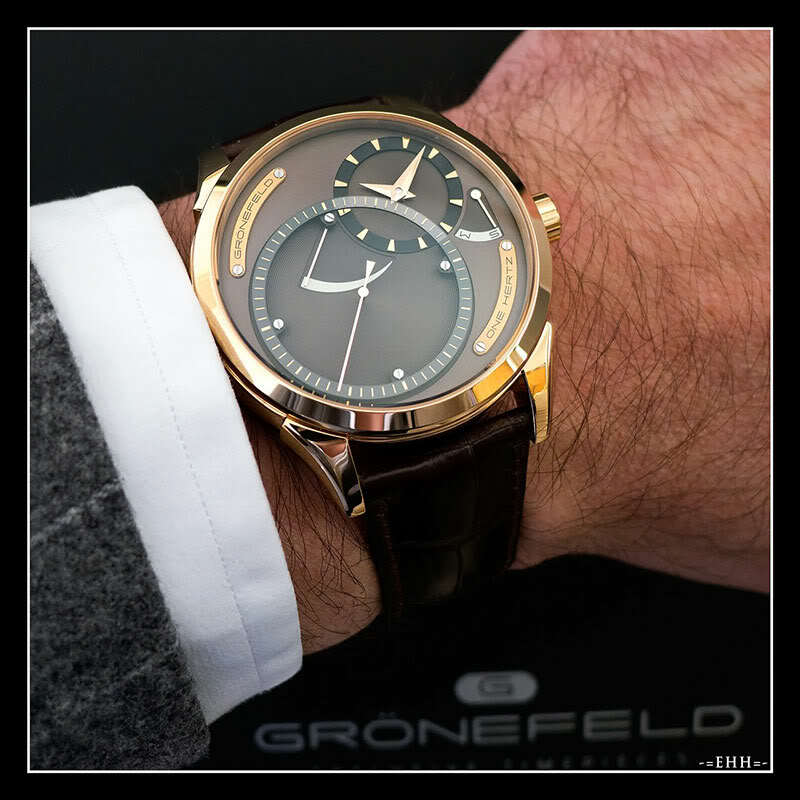 Check the new configurator on the Grönefeld’s website (here)to mix and match cases, dials and straps. 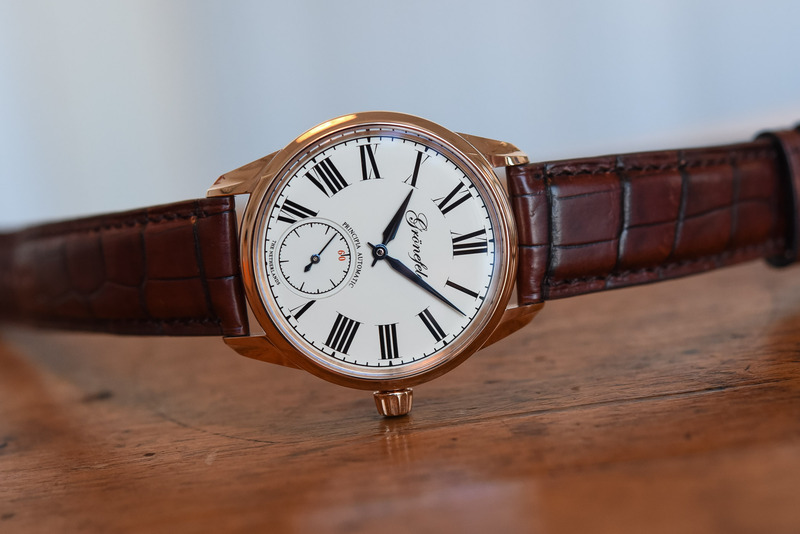 Also, a rather unique version with a cream lacquered dial and Roman numerals will be available – a watch that is a tribute to the Grönefeld family, which uses the logotype first used by Bart and Tim’s grandfather, Johan Grönefeld, back in 1912 and the ’60’ on the small seconds sub-dial in a subtle shade of orange, as a reference to Bart and Tim’s country of birth, The Netherlands. All versions feature superbly finished “Lancette” hands, executed in flame-blued steel with a mirror polished centre. 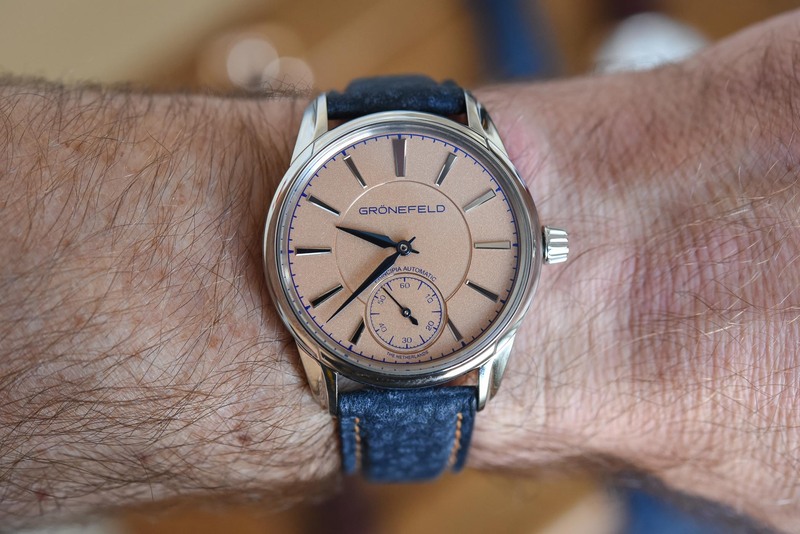 Altogether, with the exception of the aperture used to display the governor, the Grönefeld 1941 Principia is faithful to the design introduced on the 1941 Remontoire. What drastically changes is the mechanics. The new 1941 Principia features a new movement (entirely new and not based on a previously used architecture), which, for the first time, doesn’t feature an exotic complication – no remontoire, no dead-beat second, no tourbillon… just an apparently simple 3-hander automatic movement. That being said, a close look at this new calibre reveals an architecture, a style and a decoration that remain faithful to the Bros’ work. 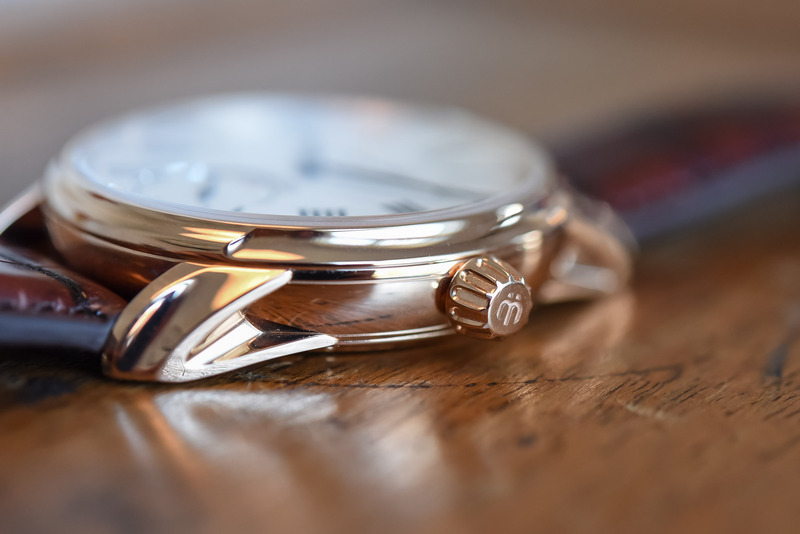 While featuring a central rotor (unidirectional, made of 22k gold), the movement retains the classical architecture of the Horological Brothers, with most parts visible and held in place by peripheral bridges. Here, even with an automatic winding system, the movement isn’t covered by a large, obstructive central bridge. The finger-like bridges leave the view clear, just to let us appreciate the decoration of this movement. This new calibre comprises 226 parts and boasts a comfortable 56h power reserve. While “just” a 3-hander, it comes with certain sophisticated solutions, such as a variable-inertia balance wheel and a free-sprung balance spring (because gravity is a friend of the winding system but an enemy of the escapement). In terms of decoration, no shortcuts. 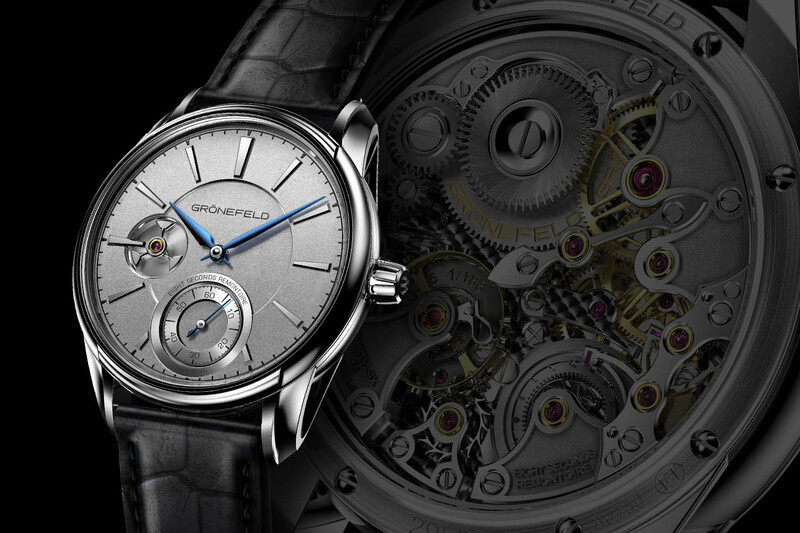 The Grönefeld 1941 Principia relies on all the tricks previously seen on other watches of the brand. It means frosted, hand-polished and bevelled steel bridges, fully decorated ruthenium electroplated brass main plate, gold-coloured 5-arm, double spoke gear-train wheels, solid gold chatons for some of the jewels and a frosted and bevelled gold rotor. Just look at the transversal balance bridge, with its ultra-sharp shape, and you’ll understand that this watch is true Haute Horlogerie. All in all, the movement takes about five weeks to be decorated and assembled (so just a few days less than the complex Remontoire movement). Finally, the Grönefeld 1941 Principia is available in a non-limited production (the only limitation will be the production capacity). A vast variety of leathers and colours are available for the straps. Each watch will be delivered with a double axis watch-winder made by Bernard Favre. As for the price (all excl. 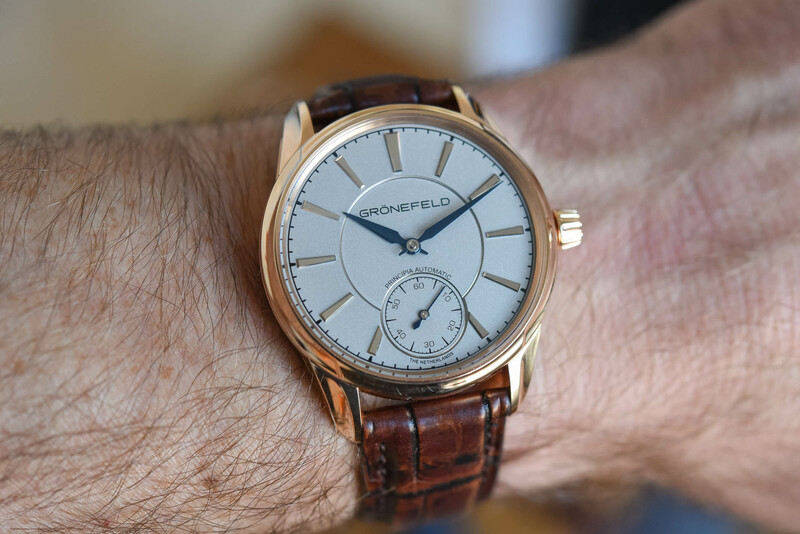 taxes), the Grönefeld 1941 Principia starts at EUR 29,950 in stainless steel (for the comparison, the 1941 Remontoire in steel is EUR 44,900) and will be EUR 37,300 in 18k red gold and EUR 38,750 in white gold. Certainly, it is quite a steep price for an automatic time-only watch. Yet, few can compete when it comes to the attention to details you’ll find on the dials and case, as well as on the movement’s decoration. Yes, the 1941 Principia is simpler but no less desirable. More on the Horological Brothers’ website here. Each watch will be delivered with a double axis, watch-winder made by Bernard Favre. I can’t say it’s a bad watch. But my expectation to them is much higher. 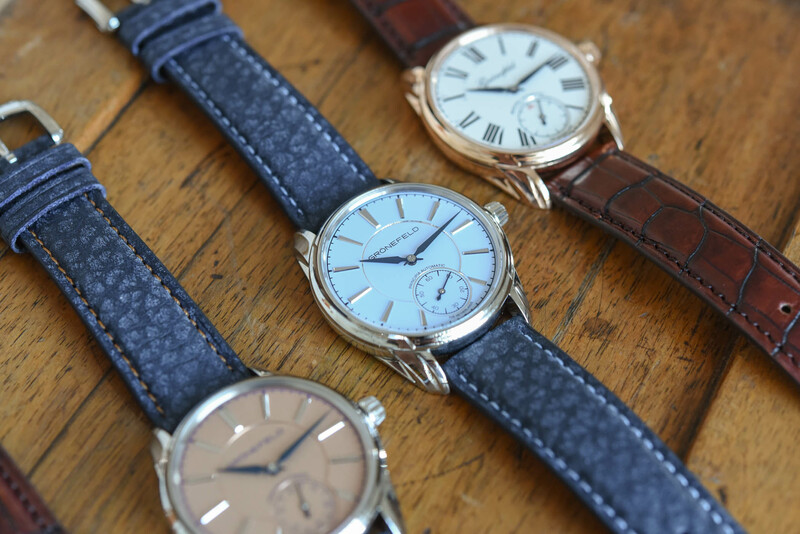 Thanks for telling us about and showing us these lovely watches. 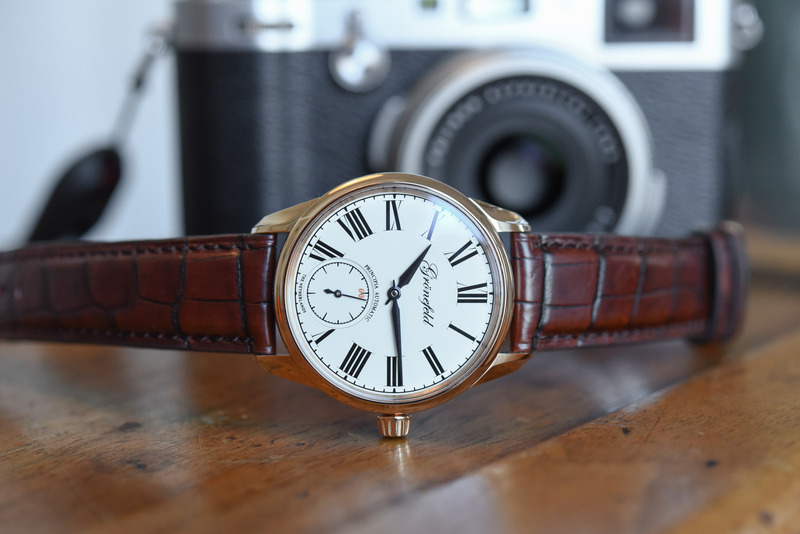 I do like to see a simple dress watch very nicely done. However, gravity does not substantially affect the winding mechanism of an automatic watch. This has been demonstrated by the automatic watches that have been into space, like the Sinn 140. A better reference to Newton would be his second law of motion, since changes in momentum cause an automatic winding system to work. Beautiful watch: just a shame about a) the rotor, blocking the view, and b) including a winder seems a bit silly [and must add to the cost, rather pointlessly] – yes perhaps, for perpetual calendars and multiple astronomical complications, but who wants to wear out a simple 3-hander’s gears when it’s unworn? I agree with Chia-Ming on this one. 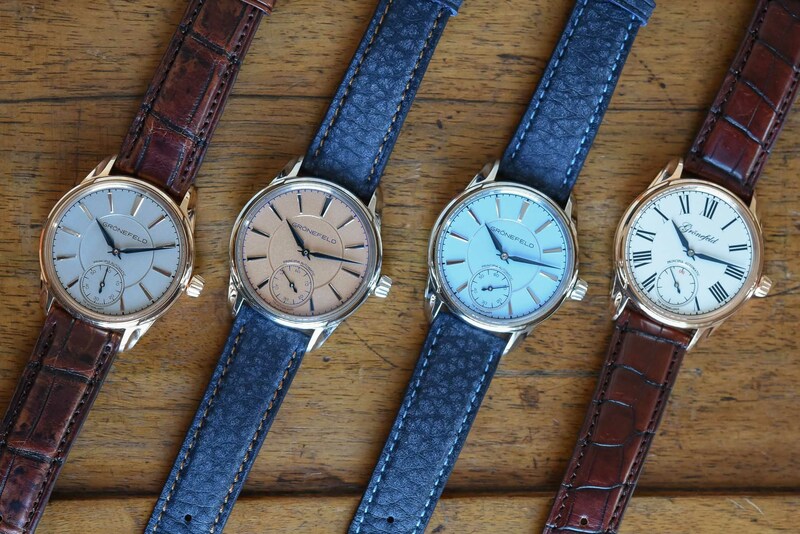 For unusual 3-handers in this rough price range I’d rather have something like an Urban Jurgensen, or Lang & Heyne. However, if we were looking instead at the One-Hertz, I’d have no reservations.